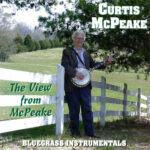 Banjo legend Curtis McPeake was one of the architects of modern bluegrass music and is a 2018 recipient of the International Bluegrass Music Association‘s Distinguished Achievement Award and the 2010 recipient of the Uncle Dave Macon Days Trailblazer Award. Now in his 9th decade, Curtis is still going strong, releasing a new album and receiving the IBMA’s Distinguished Achievement Award for his lifetime of work as a banjo player and vintage instrument expert. During a career spanning 70 years in the country music business, McPeake has played stints with several world-famous bands -including some of the biggest names in the history of bluegrass music. In the early 1950s, Curtis began to appear on the Lester Flatt & Earl Scruggs TV show, and eventually came to be counted on as a stand-in for Earl when one was needed. Curtis also played with Bill Monroe and the Blue Grass Boys in 1960-61, playing Carnegie Hall and cutting 18 classic songs with Monroe on his Mr. Blue Grass and Blue Grass Ramble albums. After leaving Monroe, Curtis joined Wilma Lee & Stoney Cooper and worked with them throughout 1963. After this stint he signed on with WSM as a staff musician and played the Grand Ole Opry for several years. He was also much in demand as a studio musician during this time, adding his signature sound to hundreds of cuts by various artists. Curtis left the Opry in 1970 to join Danny Davis and the Nashville Brass and toured around the world with them until 1987. Undated Grand Ole Opry performance with Wilma Lee & Stoney Cooper. Curtis’s break starts at 0:45.